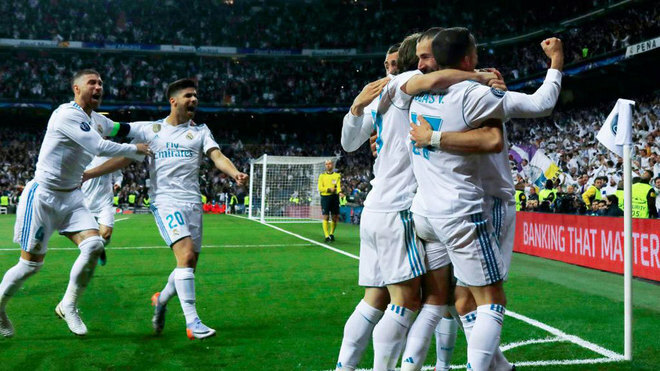 A pair of goals from Karim Benzema and superb goalkeeping from Keylor Navas was just enough to send Real Madrid to a fourth Champions League final in five years thanks to a 2-2 draw with Bayern Munich in their semi-final second leg on Tuesday night at the Estadio Santiago Bernabeu in Madrid. The French striker scored a goal in each half, but Los Blancos had to withstand a furious charge from Bayern Munich, who got an early goal from Joshua Kimmich and a second-half score from James Rodriguez to make for a dramatic final half-hour. 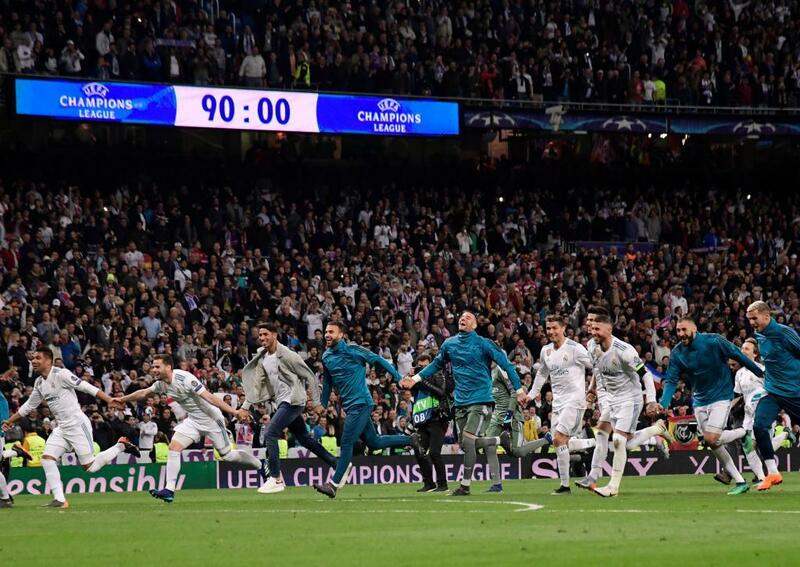 In the end though, as they always seemingly do in Europe, Real emerged victorious and will now take aim at a 13th Champions League crown later this month in Kiev. With Dani Carvajal and Isco both out injured, manager Zinedine Zidane had to do some shuffling to his starting XI, with Lucas Vazquez slotting in at right-back and Mateo Kovacic in midfield, while the odd man out was Casemiro. Also getting a start was Karim Benzema up top with Cristiano Ronaldo, while the bench beckoned for Gareth Bale. Bayern came out flying and taking a page out of Juventus’ book, they scored very early to put the Bernabeu on edge. 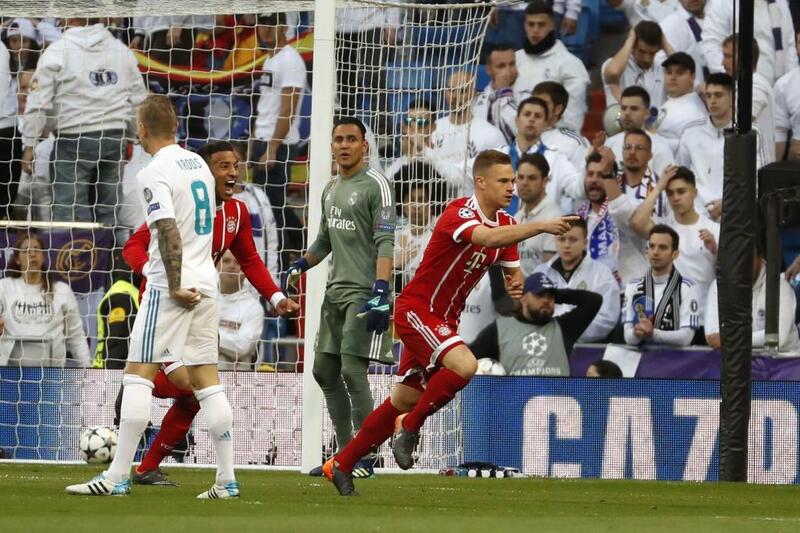 Thomas Muller played a dangerous ball into the Real area and when Sergio Ramos failed to clear, Kimmich was there to pounce and fire in past Real goalkeeper Keylor Navas to give Bayern a 1-0 lead. The reaction from Real was almost immediate. A 28-pass sequence from Real ended with Marcelo floating a cross over to Benzema, who was left unmarked by David Alba, and the Frenchman guided a header into net to make it 1-1. The back and forth between the two clubs was exhilarating, and the Munich side could not believe their misfortune shortly after the half-hour mark when they spoiled two golden opportunities. A slaloming solo run from Mats Hummels saw the centre-back play in for Robert Lewandowski, whose shot was blocked high up into the air by Navas. James came flying in hoping to score off the deflection but missed badly over the crossbar from just two metres out. Bayern would get one last look before intermission and they felt aggrieved when a James cross struck Marcelo’s hand in the penalty area, but their protestations were ignored by referee Cuneyt Cukir. As good as Bayern were in the first-half, they were shockingly bad to start the second. 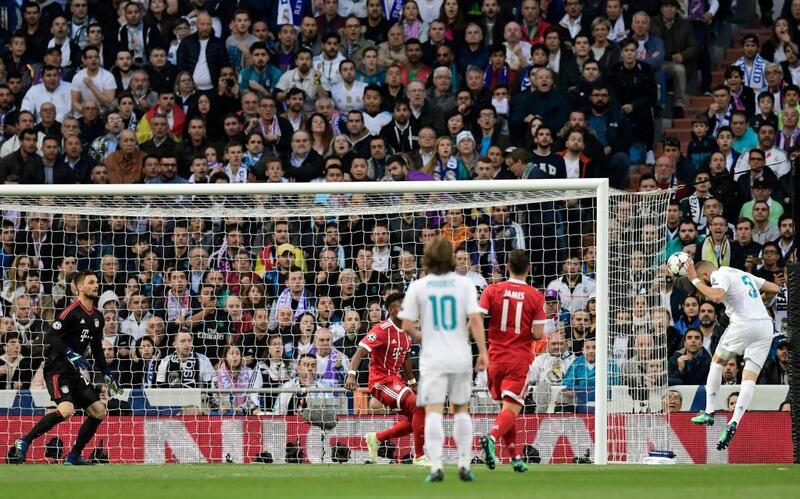 Corentin Tolisso played an ill-advised back-pass to goalkeeper Sven Ulreich, which he astoundingly allowed to pass underneath him and Benzema could not have asked for an easier goal to give Real a 2-1 lead in the match and 4-2 on aggregate. Bayern were down but not out and Navas had to react quickly to deny Alaba’s deflected shot that appeared goal-bound. But forced to throw numbers forward, the Germans were leaving themselves exposed in the back and they were lucky that Ronaldo did not make them pay when he missed badly off a Marcelo cross. It was only fitting though that this tie between two European giants would be on a knife’s edge heading into the final 30 minutes or so, and James duly set the stage for a dramatic finale by scoring Bayern’s second. The Colombian smacked a volley that was blocked, but he swooped in and scored the rebound to make it 2-2 in the match and just 4-3 to Real in the tie. Zidane needed his team to regain control, so Casemiro and Bale were called on to handle matters, replacing Kovacic and Benzema, respectively. But it was Navas who had to shine bright again, this time making a reaction save of a Tolisso chance from close-range. Even the most casual of observers were likely biting their nails in the final minutes, as Bayern lurched desperately for a tie-clinching score. Twice the goal was there for the Bavarians, but Navas came to the rescue on each. With just seconds remaining there was one last ball and it was there for Muller to be the hero, but he wasn’t able to get on the end of a cross right as Cukir brought the final whistle to his lips. 2.- Real Madrid: Keylor; Lucas, Varane, Ramos, Marcelo; Kovacic (Casemiro, min. 72), Modric, Kroos, Asensio (Nacho, min. 88); Benzema (Bale, min. 72), Cristiano. 2.- Bayern Munich: Ulreich; Kimmich, Sule, Hummels, Alaba; Thiago, Tolisso (Wagner, min. 75), James Rodriguez (Javi Martinez, min. 84); Ribery, Muller, Lewandowski. Goals: 0-1, min. 3: Kimmich; 1-1, min. 11: Benzema; 2-1, min. 46: Benzema; 2-2, min. 63: James. Referee: Cuneyt Cakir (Turkey). Yellow Cards: Modric (Min. 62) for Real Madrid, Lucas Vazquez (Min. 65) for Real Madrid, Casemiro (Min. 89) for Real Madrid.